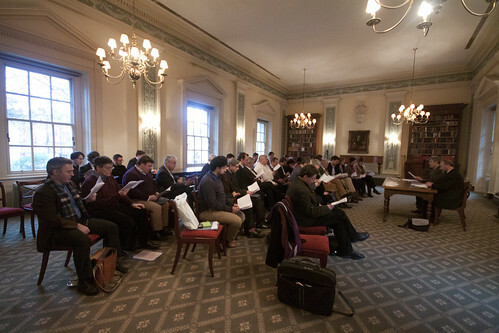 The Latin Mass Society has long been the sponsor of the monthly Sung Masses organised by Juventutem London; this Saturday, thanks to the LMS, the Juventutem Schola will be receiving training from the young professional musician, Graham Neal, a day arranged by the Latin Mass Society's London Director of Music, Matthew Schellhorn. Graham Neal read music at the University of Surrey where he was awarded the Robert Naylor prize for the most meritorious degree recital. During this time he held a choral scholarship at Guildford Cathedral. Graham subsequently studied on the Knack opera course at the English National Opera and as a postgraduate at Trinity College of Music. He now studies with Jenevora Williams and Nicholas Powell. Graham has a wide repertoire as an oratorio soloist. This year he has sung Mahler Symphony No. 8, VerdiRequiem, Rossini Petite Messe Solennelle and Bach Mass in B minor. On the operatic stage, Graham has performed the roles of Don Ramiro, La Cenerentolafor Brent Opera and Opera Loki, Ferrando, Cosi Fan Tutte at Greenwich Theatre, Belmonte, Die Entführung aus dem Serail in Camden, Sextus Julius Caesar at Blackheath Halls, Don José Carmen at Greenwich Theatre, and Worldly Glory Pilgrim's Progress for the Philarmonia at Sadler's Wells, as well as being a chorus member for English National Opera, Festival d'Aix-en-Provence, Opéra Comique, l'Orchestre des Champs-Elysées and Stanley Hall Opera. Graham is adept at choral singing, appearing frequently in concert and on recordings. He sings with the Monteverdi Choir, Polyphony, Philharmonia Voices, English Voices, the NDR Chor and Cappella Nova. Recent television appearances have included John Eliot Gardiner's Bach Marathon and Bach: A Passionate Life for the BBC with the Monteverdi Choir. Any readers who happen to be in Orkney next week would be most welcome to come and hear me talk about my reconstruction of the music for the rhymed Office in honour of St Magnus of Orkney. This seminar will be held at Orkney College. Free entry. All welcome. Free concert for PMMS members! On Friday 11th September, at 6pm in Lincoln College Chapel (Turl Street, Oxford), there will be a PMMS-sponsored concert, showcasing music that can be associated with the Dominican Order--both friars and nuns. Sung by a small group of Oxford choral scholars, the programme will include Dominican chant, Dominican-composed sequences, Notre-Dame polyphony (used as binding fragments in Dominican books), and trouvere songs compiled by a Dominican. emaileleanor.giraud@lincoln.ox.ac.uk to reserve a place. A Gregorian Chant Workshop will be held at Ealing Abbey, West London, on Saturday 15th and Sunday 16th August, led by Christopher Hodkinson, director of the Schola Gregoriana Cambridge. PREPARE TO SING AT MASS FOR THE ASSUMPTION OF OUR LADY! This Workshop is being promoted by the Ealing Abbey Lay Plain Chant Choir under the direction of Fr Peter Burns. All with basic experience of singing plain chant or choral music welcome. The City of London Festival is presenting a Wren ChoralMarathon on Saturday 27 June. Seventeen choirs will perform in seventeen of Christopher Wren’s City churches, including St Paul’s Cathedral, between 8 a.m. and 1 a.m. The a cappella concerts will feature a wide array of ensembles performing a broad range of musical styles. The concerts are free to attend, and with the churches spread around the Square Mile, it should be possible to attend them all! If you would be interested in taking part, please contact Eleanor Mottram, the Festival Administrator (Eleanor.Mottram@colf.org, tel. 020 7583 3585). A Solemn Requiem for King Richard III will be celebrated, according to the usus antiquior of the Roman Rite, at Fotheringhay Church on 13 June. When: Saturday 13 June, at 4 p.m. The music will include plainsong, English fifteenth-century polyphony and a new motet in honour of the king. Retiring collection. Supported by the Richard III Society and the Friends of Fotheringhay Church. The Annual General Meeting of the Plainsong & Medieval Music Society is taking place in Bristol in conjunction with a conference on medieval liturgy. See here for more details. On the conference itself, here is the description. The Royal School of Church Music has just announced the publication of The RSCM Guide to Plainchant: An introduction to plainsong. A revision of the seminal and best selling ‘Plainchant for everyone’ by Dr Mary Berry, the leading plainchant expert who died in 2008. This new edition, revised by one of Dr Berry’s pupils, John Rowlands-Pritchard, is re-set with improved and clearer layout. It also includes a new anthology of plainchant that singers and choir directors will find invaluable. Cantors, in particular, will find this book essential reading. Mary Berry, CBE (Sister Thomas More) (29 June 1917 – 1 May 2008) was an Augustinian canoness and noted choral conductor and musicologist. She was an authority on the performance of Gregorian chant. John Rowlands-Pritchard was a pupil of John Stevens at Cambridge, and gave lecture demonstrations of Professor Stevens’ isosyllabic interpretation of mediaeval monody. He studied the performance of early chant with Dr. Mary Berry, illustrating her lectures and broadcast talks, and sang and recorded regularly with her specialist group Schola Gregoriana of Cambridge as Cantor, and continues to give masterclasses in Plainchant across the country for the RSCM. The Association’s meeting for 2015 marks a completely new departure: a short summer school over two days, at the School of the Annunciation, Buckfast Abbey, Buckfastleigh, Devon, TQ11 0EE. Website: schooloftheannunciation.com. The summer school will run from lunchtime on Monday 17 August to lunchtime on Tuesday 18, and the cost, including one night’s accommodation at the School’s residential centre, breakfast, and the use of the School’s facilities will be £80 per person. For non-residents, the charge is £20. The cost of two lunches and one supper in the Abbey restaurant will be additional to this, costing in the region of £10-£15 for lunch and from £15-£25 for supper, depending on which options guests choose. If you would like to extend your stay at the Abbey, or to take in the summer school as part of a holiday in the West Country, contact the School of the Annunciation direct to book a further stay. Alternatively, there are several bed and breakfast establishments in the immediate vicinity. The summer school will focus on active involvement in chant, using chants from the work in progress on the Graduale Parvum, less-florid chants based closely on the Graduale Romanum, currently the ALL’s flagship project, and on an investigation of the ‘untranslatable’ elements of the Latin Missal. The chant workshops will be led by Fr Guy Nicholls, and will culminate in participation in the sung Mass on the Tuesday, while the theme for the translation workshop will be: “Hidden Treasures: what no translation can ever tell us.” In these sessions, led by Mgr Bruce Harbert, we will investigate elements in the original Latin which cannot be carried over into the vernacular. Participants should bring with them a copy of the Ordo Missae (Ordinary Form) in Latin and English. If these are not readily to hand, copies are usually available for purchase in the Abbey’s excellent bookshop. The music for the chant workshops will be provided, and is included in the fee. Please send, by 1st July at the latest, a cheque for £80 (residential) or £20 (non-residential) payable to Association for Latin Liturgy, to The Treasurer, ALL, 47 Western Park Road, Leicester, LE3 6HQ. Please give a postal and an email address. Please check first to see if accommodation is still available, by email to Christopher.Francis@latin-liturgy.org. From Wednesday 8th till Friday 10th July, the solemnity of Saint Benedict will be prepared with Jean-Pascal Ollivry in the convent of the Carmelite Fathers (Ezelstraat) at Bruges, Belgium. An English-language prospectus detailing all the events can be seen here. Online bookings can be made on the website of l’Académie de chant grégorien. The reinterment of the remains of King Richard III in Leicester this Thursday is an event which has been much discussed. Among the music to be sung on this occasion there will be both medieval plainsong antiphons* and new compositions incorporating chant motifs. The music for the service is discussed on the blog How to Rebury a King, by Dr Alexandra Buckle, here, here and here. * The video found on this page shows the choir of New College, Oxford singing two of these antiphons: In paradisum (starts rather abruptly) and De terra. The Twelfth International Gregorian Festival of Watou (Belgium) will be held from 13 to 17 May 2015, with pre-conference events across French and Belgian Flanders from 8 May onwards. The full programme has been released, and all details can be seen at the Festival's English-language website. There will be performances by 29 scholas from 17 countries. The UK is not represented this year, though English choirs have sung at Watou in the past. The Festival is held every three years. The Sacred Voices of the Levant invite you to a concert of sacred Levantine (Middle Eastern) music and chant, for the deliverance of Iraq and Syria, on Saturday 28 March 2015, at 6 p.m., at St Barnabas Church, St Barnabas Street (off Pimlico Road), London SW1W 8PF. The concert will feature Syriac and Byzantine chants for Lent and Holy Week, performed by the choirs of the Levantine Churches in London, namely the Melkite, Syriac (Syrian Orthodox), Maronite and Chaldean choirs. Entrance is free, but a collection will be taken for the refugees in Syria and Iraq. The Monastic Chant Forum will hold a 3 day meeting at Quarr Abbey from the evening of Monday 13th July (arrivals) to the morning of Friday 17 July (departures), 2015. This will be the eighth such meeting in the history of this group, which aims to promote Gregorian Chant within the Monasteries of the British Isles. Although the emphasis is on Gregorian Chant in a specifically Monastic context, anyone from a non monastic background who is interested is welcome to attend. The general theme for 2015 will be music for the Blessed Virgin Mary. The main speakers will be Dr. Giedrius Gapsys, musicologist of the Paris Conservatoire, specialising in Gregorian Chant; Dom Xavier Perrin OSB, Prior of Quarr Abbey, and Sr. Bernadette Byrne OSB, Choir Mistress of St. Cecilia's Abbey, Ryde. We are delighted to announce the 2015 study day, as part of the Senses of Liturgy conference in Bristol, on 21-22 May 2015. Registration details, already-agreed-papers, plus open call for papers can be found here: Senses of Liturgy There are good discounts for Plainsong and Medieval Music Society members, and there are also some bursaries available for postgraduates who are presenting a spoken paper or a poster. We are delighted to announce that our President, Bruno Turner, has been awarded Spain’s top Arts/Cultural award, La Medalla de Oro al Mérito en las Bellas Artes. Bruno was the founder of the publishing company Mapa Mundi in 1977, and was the founding conductor of the choir Pro Cantione Antiqua, releasing several CDs with that group. He has had a lifelong interest in Iberian music, as an editor, a composer and a scholar. We would like to offer Bruno our warmest congratulations on this honour. PMMS-sponsored event (jointly with EECM and RMA) Facing the Music of Medieval England will take on 21-22 March at the University of Huddersfield. The keynote will be given by Margaret Bent, and the programme showcases many speakers who are members of PMMS. Registration will open soon and cost no more than £15. You can have a preview of the programme on the MuGI twitteraccount. For more information contact Lisa Colton at l.m.colton@hud.ac.uk. Advance notice: the 2016 Study Day will take place at the University of Newcastle, hosted by Dr Magnus Williamson, and linking with his AHRC-funded Tudor Partbooks project. The likely date is 9 April 2016.
and Fr Guy Nichols, Director of the Newman Institute of Sacred Music. The next meeting of the Gregorian Chant Network will take place on Saturday 14th March. For the first time it will be open to all. Directors of chant groups registered with the GCN will get a discount. We will be addressed by Dr Daniel Saulnier, former choirmaster at Solesmes, and Giovanni Varelli, Cambridge researcher who discovered the manuscript of the earliest written polyphonic music, which will be performed at the meeting. Photo: Gruppo vocale "Antiqua Laus"
We have recently been sent some information and recordings by the Italian choir "Antiqua Laus", who specialise in Ambrosian and Gregorian chant, and sacred polyphony. The choir was founded in 2008, initially in order to give voice to an ancient codex of Ambrosian chant, which had been discovered at the parish church of Coarezza (Varese). Since then, Antiqua Laus have recorded several CDs, of which the first was Jesu dulcis memoria (Universal, 2009). Canonica San Vittore - Bedero in Valtravaglia (2014). This latest volume includes a facsimile edition of a thirteenth-century Ambrosian antiphoner, and is a considerable addition to the published corpus of medieval Milanese chant. The book is accompanied by a CD, featuring Vespers and Mass in honour of St Victor, sung by the choir with organ improvisations by Alessandro La Ciacera from Milan Cathedral; and also by an interactive DVD. The next project will involve one of three fifteenth-century antiphoners from the Collegiata di Castiglione Olona (Varese). The choir thus continues to recover and enrich the repertory of Ambrosian chant through scholarship, concerts, recordings and liturgical performance.